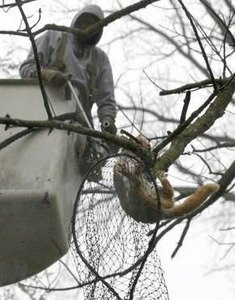 A Wisconsin cat spent six days in a tree before a tree service managed to rescue the animal last Friday. The orange-and-white feline, apparently a stray, was taken to a shelter by the Oshkosh Area Humane Society. For six days after the cat was discovered in its lofty perch, neighbors tried to coax the feline to the ground, but without success. At that point they called AAA Tree and Stump Service, which, fortunately, had a lot of experience extracting cats from trees. After the crew arrived with a bucket truck and tried to pluck the feline from its perch, the cat climbed higher in the tree to avoid capture. Using a bit of reverse psychology, the crew positioned the bucket ahead of the cat; sure enough, the animal began to descend. As the rescue team closed in, the reluctant cat walked out on a limb, where, after two prior escapes, it was finally caught in a net. Following a few attempts, the cat was successfully transferred to a cat carrier and taken to the OAHS. The tree company did not charge for its service, although it did receive a donation by one of the neighbors. Last week another cat was rescued from a tree in North Riverside, IL. In that instance, the situation ended when the feline jumped safely to the ground and fled after spending seven days in the tree.